The Cyclingnews video page brings alive the race action for you in moving pictures. Enjoy watching the highlights of Grand Tours, muddy Classics, watch the great sprints and awful crashes – in short, enjoy cycling at its finest. Cyclingnews and the Amaury Sport Organisation (ASO) with the support of Orbea bring to you these special video highlights of each stage of this year's Tour de France. The clips will be made available as soon as possible after each stage. The pictures come directly from the host broadcaster, by approval from ASO, organiser of the Tour de France. Please be patient as the file buffers to your system and begins to play. The video is available as a Flash movie, and will play on most systems with the Flash player installed. If you need to install the Flash player, please go here. With le Tour over and gone for another year, now we can relax and take a look back at the race that was. Cyclingnews also presents 10 clips from the vaults that cover some of the most memorable moments from recent Tours, as well as some behind-the-scenes looks at the Tour de France as it rolls its way through the country every July. The first of our 'Best Of' clips is a wrap-up of the Tour's most dominant rider in recent years, Lance Armstrong. This clip provides a re-cap of his extraordinary reign in France, securing seven straight victories from 1999 until 2005. The next clip takes a look behind the scenes of the Tour, as we join the race's promotional 'caravan'. We may see the Tour as a sporting event, but it's also a huge business and this video shows how the caravan weaves its way through the French countryside on every stage of the Tour, distributing phenomenal amounts of promotional products. The caravan itself stretches for some 20 kilometres along each stage, and takes the best part of 40 minutes to pass any point on the stage, providing spectators with ample opportunities to collect free souvenirs. Next up we review the dramatic Centenary Tour in 2003, and the next clip is a review of Miguel Indurain's five victories in the Tour de France (1991-1995). Who can tire of watching the great Spaniard in full time trial mode? Indurain's feats in the TTs were superlative and this clip covers some of his most memorable efforts. In the following clip we present some of the heart-stopping crashes of the Tour in recent years and then there is a peak behind the scenes of the village depart, the bustling centre that is part bike race, part exhibition space and full-time meeting place. No Tour is complete with the famous climbs; those brutal, long and beautiful peaks that always create the final selection in every year of the Tour. This clip looks at the history of these climbs, such as the Col du Galibier and Mont Ventoux, the 'Giant of Provence' as it's known. The next clip is a feature on the Letape de Tour, that special event that's been held since the mid '90s where thousands of 'regular' cyclists test themselves by riding a complete stage of the Tour, with the roads closed to traffic for the day. Our next clip is called 'Le Soap Opera', this reviews the whole range of emotions on display as riders push themselves beyond their physical limits. The final clip from the archives shows the Tour's humourous and lighter side, this feature includes vision from many Tours in years past, with some light-hearted moments showing how the riders break the tension along the flatter stages - by swapping bikes, or dodging errant cattle and spectators. It shows that despite all the drama and exertion, there's always time to look around and enjoy the spectacle. Cyclingnews and the Amaury Sport Organisation (ASO) have teamed up to bring to you these daily video highlights of each stage of this year's Vuelta. Containing all the essential race day action, the clips will be made available as soon as possible after each stage. 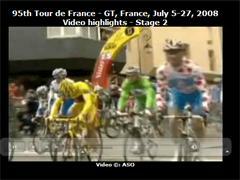 For more videos from le Tour and other races, click here.